Is aging infrastructure an imminent problem that is bearing down on the U.S. utilities industry? Or is it a minor challenge to be addressed over a long period of time, on a pole-by-pole basis? The answer depends on who you ask. We tend to agree with Willis. At Alden, we see our utility partners and clients addressing aging infrastructure on an as-needed basis, often using a risk-management approach. Comprehensive replacements would be too costly and may be unnecessary. While poles typically have a life expectancy of 30 years, many poles can continue to be reliable and strong for much longer depending upon the climate where they are placed. What’s Wrong with the Typical 10-Year Cyclical Inspection? A standard approach to field asset maintenance is the tried and true 10-year cyclical inspection. This program inspects and services 10 percent of a company’s field assets within a 10-year period, looking for rot, damage, over-loading, or other issues. At that time, the company conducts repairs or replaces the entire pole. Fiber and broadband services are fast becoming the norm and consumers are demanding more bandwidth to connect tech devices. As technology advances, leading to more and more attachers, the loads on poles increase to unsafe levels. Consequently, pole loading is driving infrastructure problems, not necessarily related to aging. One major issue is reconciliation of pole data to properly identify asset ownership. This problem dates back to divestiture and the parity agreements that have been disengaged, causing legal battles and inaccuracies in legacy pole records for both owners and attachers. An alternative approach to the preventative 10-year cyclical inspection may be a more predictive system for managing field asset maintenance and replacement. But how would this differ from the standard preventive maintenance approach? Currently, many field asset owners, especially in the U.S., rely on preventive maintenance to manage infrastructure. With this approach, maintenance plans are scheduled based on age, events or other predetermined characteristics. Field assets are serviced or replaced based on their expected failure dates (determined by age and expected breakdown rates of similar equipment). The downside of preventive maintenance is that it may not accurately reflect the actual usage and real-time condition of the equipment. This could lead to unnecessary maintenance. Alternately, predictive maintenance (more common among European utilities and field asset owners) is based on the actual condition of their field asset. This approach predicts failures before they occur with enough time for the asset owner to deliver the needed repair or replacement before failure occurs. How Can Utilities Transition from Preventive to Predictive Maintenance? An aging infrastructure system isn’t necessarily bad. 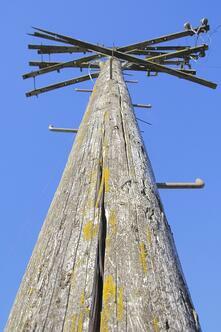 Older poles can still be strong and reliable. The key to managing future repair and replacement needs to is integrate the software and sensor tools that allow asset owners to accurately assess the current conditions of an asset (rather than relying on standard age-based maintenance schedules).